The John Deere Model 450's ("plain" model 450) originally used 8 fiber discs p/n T20716 and 7 steel separator plates p/n T20717 (T31732). When later models were developed they used bimetallic discs to replace the earlier style fiber discs. The bimetallic disc part number is T44129. The same numbers of discs were used in all circumstances. Most of the time you can get by with only changing the friction discs. The steel separator plates can usually be re-used. Check them for roughness, warping, or dishing and if they are clean, smooth, and straight, by all means re-use them! 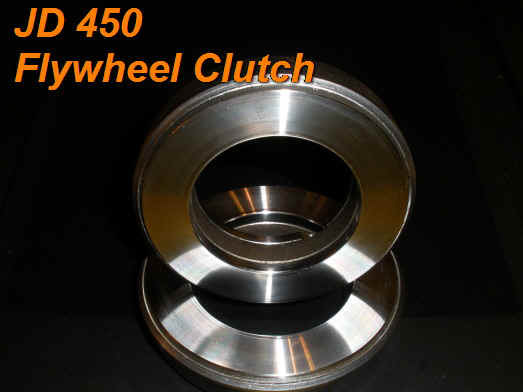 To help "steer" you toward creating a superior steering clutch we wanted to encourage you to use the bimetallic steering clutch discs and to eliminate the old style fiber friction discs. 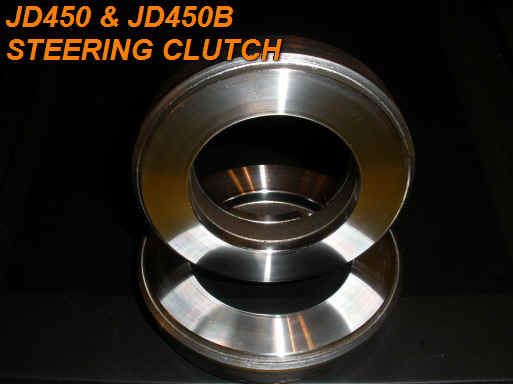 To do this, we have discontinued the fiber friction discs to make sure you get a superior clutch. When putting your clutch together it is important to get the throwout bearing close to the 3 clutch release levers. JD makes a tool for this but as you have probably discovered they do not sell the tool, and asking to borrow one, if they even have it, well.....you are better off writing a letter to Santa. 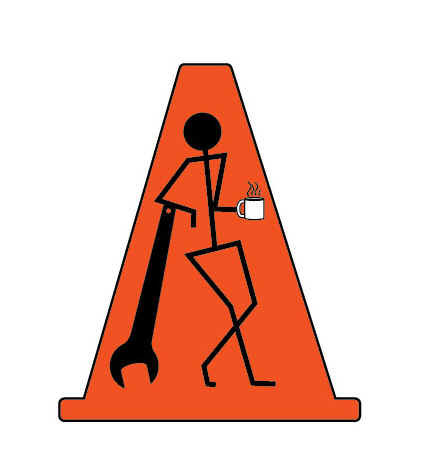 Luckily, Grimy Men stick together and help each other......You can download a drawing of the tool from our website (CLICK HERE). If you can print the file on 8 1/2 x 14 legal size paper you will have a good pattern to get you going. You can get fancy or just make the tool from a manila folder, cardboard, foam board, or whatever is handy. In US only, via Priority Mail, 2-3 day delivery, on orders $500 or higher. T44129 BIMETALLIC FRICTION DISCS 22.00 EA Will work for dry type or oil type cteering clutches. Some users prefer the paper over the bimetallic and some prefer bimetallic over paper faced discs. We provide both options. See below for paper option for oil type clutches. The T20717 steel separator plates are often confused with the T31732 plates used in the later steering clutches. To be sure which plates you have in your clutch the thickness should be measured. The T20717 will measure closer to .087- .09 while the later discs will be closer to .097-.099. If the quantity of your discs varies from what is normally required, it is usually caused by the mis-use of the wrong steel separator plates. The JD 450B used the thicker plates. AT129806 & AT129807 replaces earlier AT18420/AT18418 and AT86899/AT86898 ................. 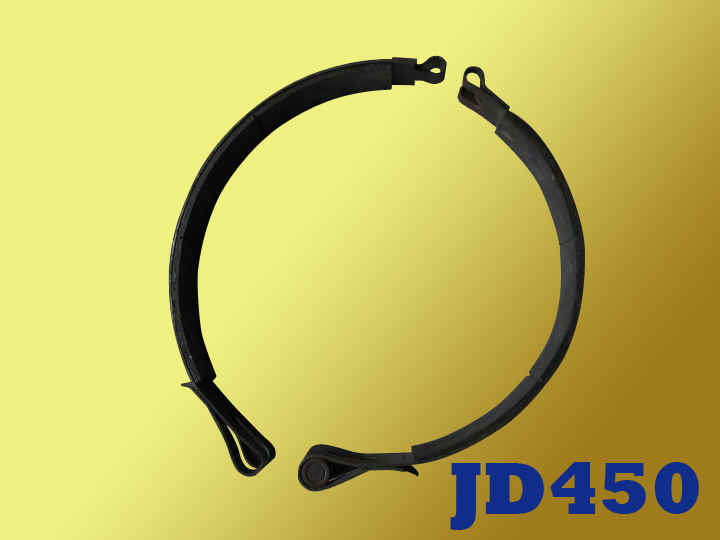 Complete 2 piece band @ $145.00 We ordered enough of these in volume to keep the cost down to make the brake band competitive with relining your own band. This will speed up your repair and cut your costs by having them ready to install. 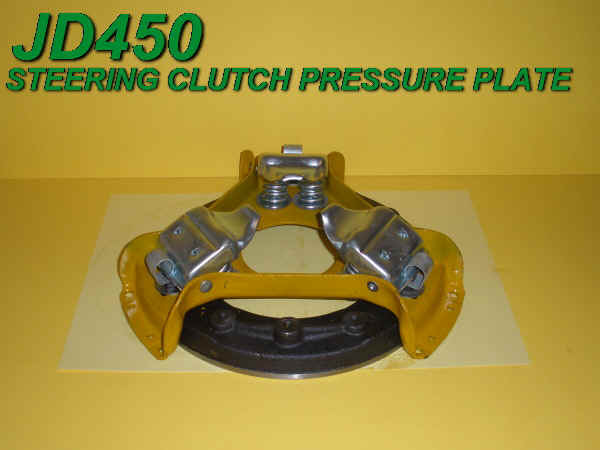 Also fits 450A,B,C's 550A,B,C's RELATED TRACK LOADERS 455'S , 555'S and more.